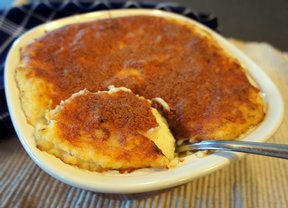 Make ahead mashed potatoes for your next holiday get together. No more mashing the potatoes while everyone is waiting to eat. You can have it all ready to go before the guests even arrive. For easy cleanup, line your crockpot with a plastic liner. Peel and cook potatoes until tender. Drain well. Mash potatoes with mixer adding cream cheese, sour cream, garlic and onion powder. Place in a casserole dish. Dot with butter. Bake at 350 degrees for one hour, microwave on high for twenty minutes or place in slow cooker on low until ready to serve. 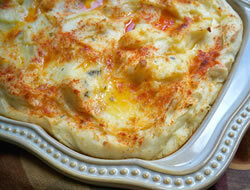 This dish can be made ahead and refrigerated for 2-3 days before baking. Recipe doubles easily for more servings. "I make this for Thanksgiving every year early in the morning. 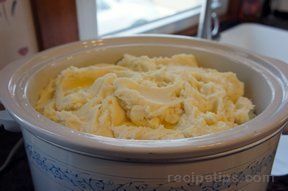 No messing around in the kitchen mashing potatoes when there is so much else to do to get dinner on the table on time."